Near the center of the United States, in southeastern Nebraska is Fairbury. The Little Blue River passes the town on the south and west edges. Major thoroughfares provide access to the community where visitors are welcomed by large brick signs and just below the population markers are emblems proudly declaring "Heritage Community". Due to its location on the Oregon Trail, the area received exposure to the pioneers and fortune seekers as they made their way west, but the advent of the railroads prompted the development of Fairbury. In 1869, Woodford G. McDowell, an Illinois capitalist and James B. Mattingly, Kentucky frontiersman and freighter combined efforts to plat a town on an Indian trail which was still used to herd buffalo but was the expected route of the railroad. Both men gave one half of their 160 acre claim in order to establish the town site with its center block reserved for public use. McDowell's hometown in Illinois became the namesake for the new community. 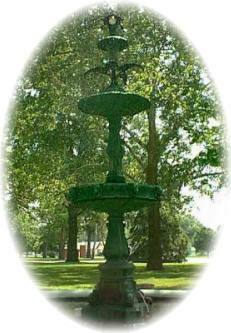 In 1871, Fairbury was selected as the county seat and later incorporated. Fairbury was the headquarters for the Campbell Brothers Circus, the second largest in the world, from 1894 to the closing of the big top in 1912. A 140 feet by 35 feet mural painted on the side of a building depicting downtown Fairbury at the turn of the century includes scenes from a circus parade. Since its earliest times, the community has preserved many of its historic buildings and landmarks to include the Jefferson County Courthouse, which was built in 1894, and much of the downtown district which remains architecturally significant from the turn of the century, along with many of the town's large, Victorian-style homes. Of special significance are those buildings listed on the National Register of Historic Places, including the Jefferson County Courthouse, the Fairbury Public Library and the I.O.O.F. Building, now Johnson's Family Eye Care Center, at 523 E. St. Also listed is the Rock Island Depot, as well as the entire downtown, which is listed as a historic district. Fairbury's proximity to the Oregon Trail allows visitors to experience first-hand the lives and hardships of immigrants. There are several historical monuments and markers telling their story, which mark the Trail as it dissects Jefferson County. Be sure to visit Rock Creek Station, an important road ranch for travelers on the Oregon Trail. Tour the visitor's center and see where "Wild Bill" Hickok began his bloody career as a gunfighter, and Pony Express riders risked their lives to carry the mail cross-country. See the ruts left by covered wagons on their way to a better life. You can camp, have a picnic, or ride in an oxen-drawn covered wagon. Fairbury is located at the junction of Hwys 15 & 136, "Nebraska's Heritage Highway", along the Oregon Trail as it enters southeast Nebraska. A long-abandoned lime kiln, looking very much like a large stone chimney stands along the River Road northwest of Fairbury. For a period of at least 20 years, it was the sight of a lime-burning operation where limestone was heated, or "calcined"